We will be doing these projects for the KIDS Craft Program at Tuxedo Library on May 8th - grades 2nd - 5th. Class is FREE. Registration is required: (845) 351-2207. Cut 3" piece of purple, floral DSP. Wrap around and adhere. Cut 2 1/2" piece of Certainly Celery. Distress it. Wrap around and adhere. Cut 2 " piece of multi-color floral DSP. Wrap around and before adhering punch a hole near the edge, upper area for the flower. Adhere the Rhinestone in the flower and then adhere the paper down. 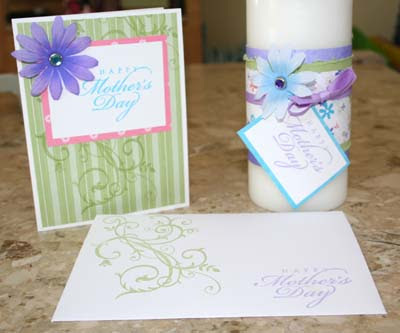 Stamp "Happy Mother's Day" in Lovely Lilac/Lavender Lace. Adhere layers. Punch hole in upper left corner. Wrap ribbon around candle and through the hole of the tag. Make bow. Cut a 4"x5.25" pieces of DSP. I chose the Certainly Celery striped piece. Then stamped the large swirl in Certainly Celery on top of it. With the greeting piece, just layered the Whisper White with Pink/floral DSP. Stamp greeting in Tempting Turquoise. Punched a whole in the upper left corner for the flower. Select a flower and rhinestone brad. Then adhere greeting tag to front of card. Stamp the large swirl in Certainly Selery from upper left corner. Stamp greeting in Lovely Lilac/Lavender Lace. being a mother i always cherish my kids craft.i am glad that you have come up with such concept. How cool is that. How did you get a gig at the library? Any suggestions for how to approach my library about such a class?